I bought a container of four salted ducks eggs from Econsave Pearl Point yesterday night when I was scouting for chicken eggs.. It's not easy to find fresh duck's eggs in Sydney, and they are quite expensive. 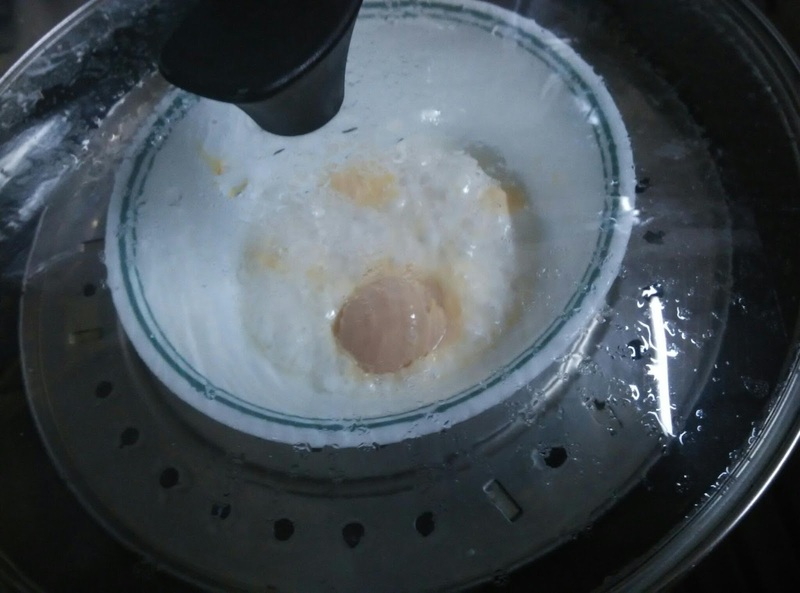 Further more, not many people are familiar with salted duck's eggs unless they have come across typical Chinese and cantonese cuisine. The ones bought in Malaysia are generally covered with black sand to preserve the eggs. When I break up the shell, the whites are liquidy, but the yolk is a bright orange. 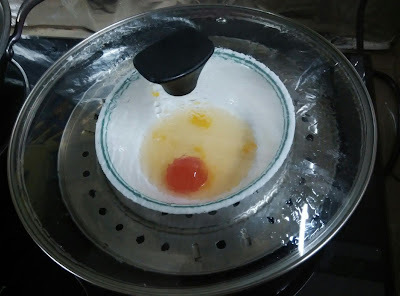 The yolk is then placed in a bowl and steamed in the sauce pan till it is cooked. Steaming raw salted egg yolk. The prawns I deshelled, and kept it separately in the freezer, as the shells have a lot of flavour when boiled with chicken bones for making stock. They are used when making broth for laksa, as well as other soup stock bases for noodles like Sang Har Meen, and kway teow soup /rice noodles. That apparently is how the noodle stalls in Ipoh boil their broth for the kway teow soup... YUM. 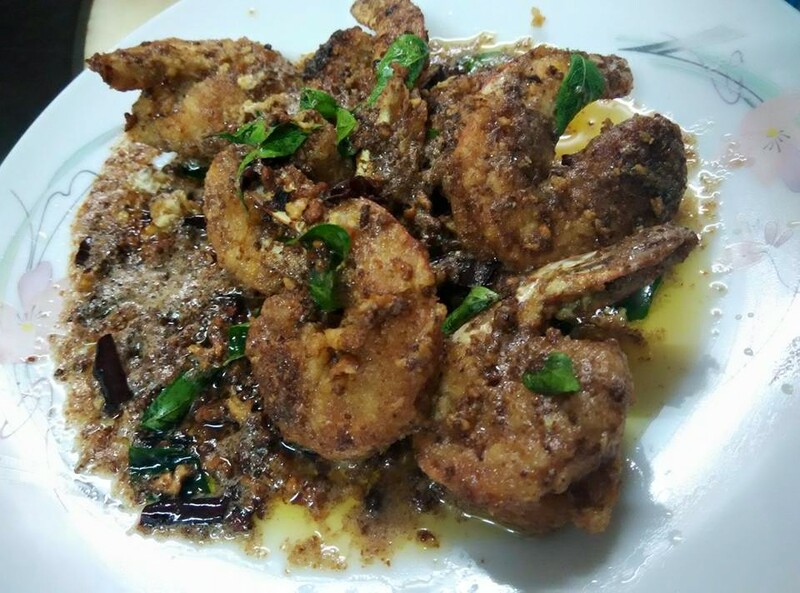 The prawns are then dipped in one beaten egg, rolled in all seasoned all purpose flour, and then deep fried until done and removed. The sauce is then prepared by sauteing butter (and some margarine to save cost) and the mashed salted eggs. Next you dump in the prawns, and then throw in some sugar, and curry leaves and dry chillies, and remove and plate. I cooked the butter too long whilst waiting for the curry but the leaves, resulting it being too caramelised, but the flavour is still there. There is three more salted ducks eggs in the container to play with so I will try to find other ways of incorporating salted ducks eggs into the dishes. My mom added some of the egg white into her stir fry cabbage to give it a tinge of saltiness. On a separate note, I bought some petai, and I have a sambal recipe, so i can incorporate that too into the sambal as well.